The House and Senate have now each passed their own similar tax bills and a conference will come up with a single unified plan. Each of the individual bills has been scored to add $1 trillion to the national debt over a ten year period and so the final plan will almost surely have this same feature. 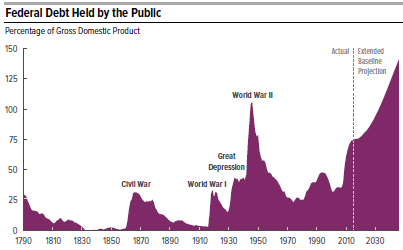 With our public (on which interest is paid) debt now 77% of GDP, the highest since right after WWII, and already growing rapidly, this is an extremely unattractive, and even dangerous, feature of the tax plan. The Republicans are the party of liberty concentrating on providing maximum opportunity for people to succeed in life by realizing their full potential. This means fostering strong economic growth in order to have lots of opportunities for self-betterment. It also means keeping government at all levels as lean and efficient as possible, so as to minimize interference with private initiative. Excessive public debt is a particular anathema by creating a huge public burden, especially on future generations. The Democrats are the party of justice concentrating on helping to provide the less fortunate members of society with the necessities of life by means of public support programs. This also means working to oppose all forms of prejudicial behavior based on race, gender, sexual orientation, etc. In addition it means trying to alleviate the inevitable income inequalities which arise in a free and dynamic society like ours, primarily with redistribution of tax revenues. Conclusion. Both parties have fundamentally important principles. They gain and keep adherents by fighting for what they believe in. If the national Republican Party becomes lackadaisical about our huge national debt, as it appears to be right now, it risks losing its reputation for fiscal responsibility. This will do it great damage. Slow economic growth, averaging only 2% per year since the end of the Great Recession in June 2009. From 1950 – 2000 the economy grew at over 3% per year and produced a prosperous American middle class. Now, with strong headwinds from globalization and constantly improving technology, we badly need faster overall economic growth to provide more and better paying middle class jobs. Income inequality. 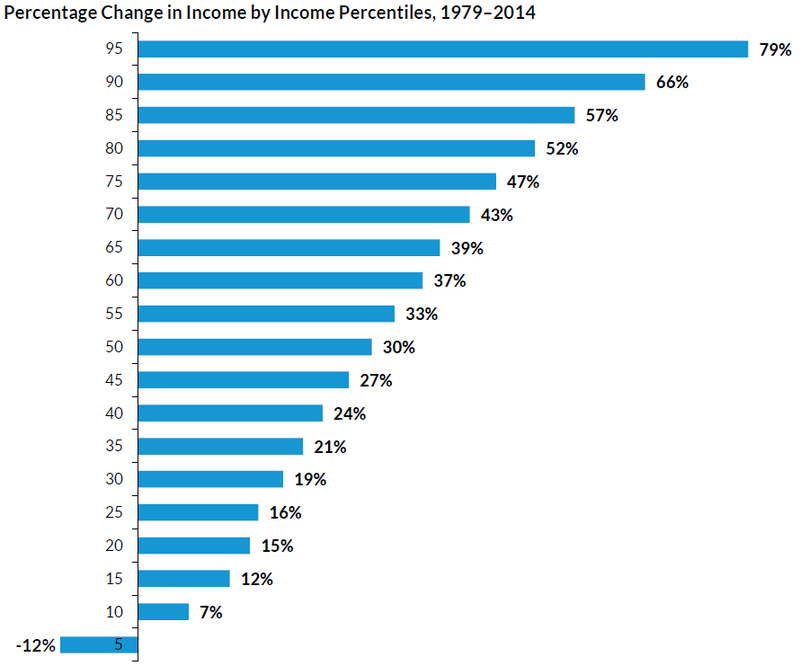 There is increasing income inequality in the U.S. even though the top 25% or so are doing very well. But raising taxes on the wealthy could slow down economic growth by discouraging new investment. In addition, redistribution of tax revenue to lower income Americans will not give them much of a boost. Income insecurity. 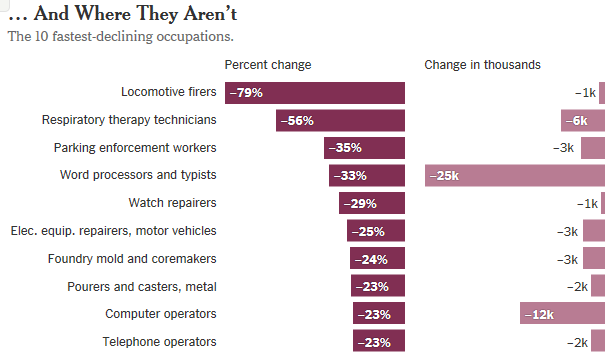 This is a huge problem for the many blue-collar workers who are struggling to make ends meet. There are a number of specific government actions which could alleviate this enormous societal problem. Economic justice. Poverty in the U.S. is widely distributed geographically, with almost as much in rural and small town areas as in big cities. This could provide an opportunity for Republicans and Democrats to work together to address a very challenging problem. Conclusion. Our country has very serious economic and fiscal problems which are not being addressed because of severe partisan infighting in Congress. But slow economic growth, income insecurity and poverty affect a wide variety of people with different political outlooks. It’s inexcusable to allow partisan bickering to get in the way of finding workable solutions. 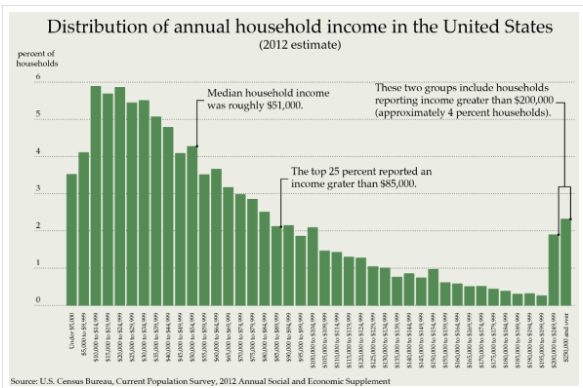 One of the topics I discuss on this blog is income inequality (here, here, and here). 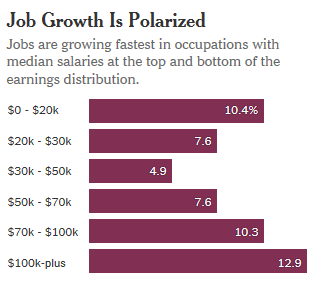 An interesting article in yesterday’s Wall Street Journal, “Upper Middle Class Sees Big Gains, Research Finds,” is highly pertinent to the inequality issue. 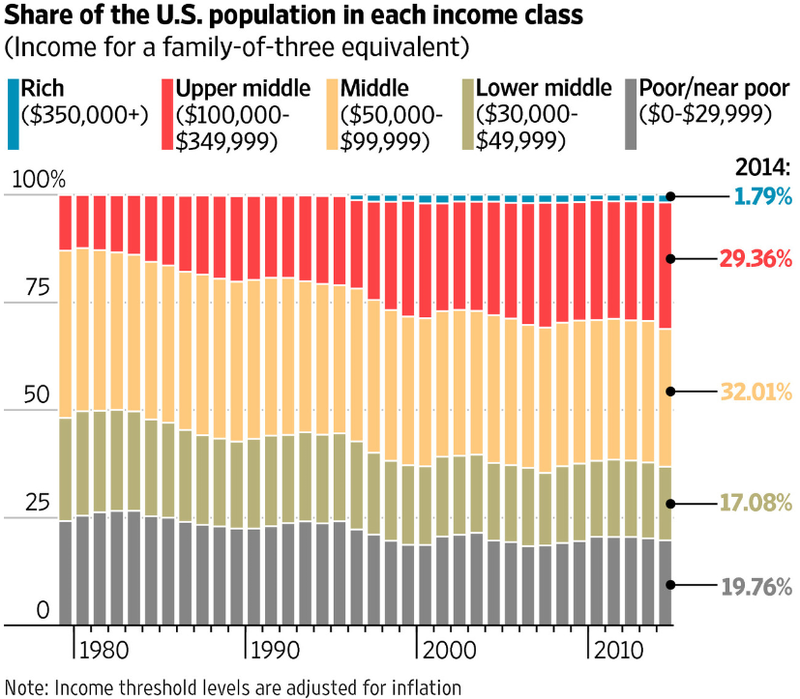 As can be seen in the above chart, the percentage of people in the middle class or above has greatly expanded between 1979 and 2014. Furthermore, the basic research on this issue,by Stephen Rose at the Urban Institute, shows very clearly (in the chart below) what is happening: the higher is a family income, the faster it is increasing. Grow the economy faster with broad-based tax reform (lower tax rates paid for by shrinking deductions), immigration (guest worker) reform, (fair) trade expansion, and regulation reform (to help more small businesses get started). This will create more jobs and better paying jobs. Improve education with early childhood education (to get minorities off to a better start in school), boosting high school graduation rates above the current 80% average (with better career and vocational education) and making college more affordable by putting more resources into community colleges and scholarships for low-income students. Combat social inequality. The fraction of children with a single parent is the best predictor of upward economic mobility. 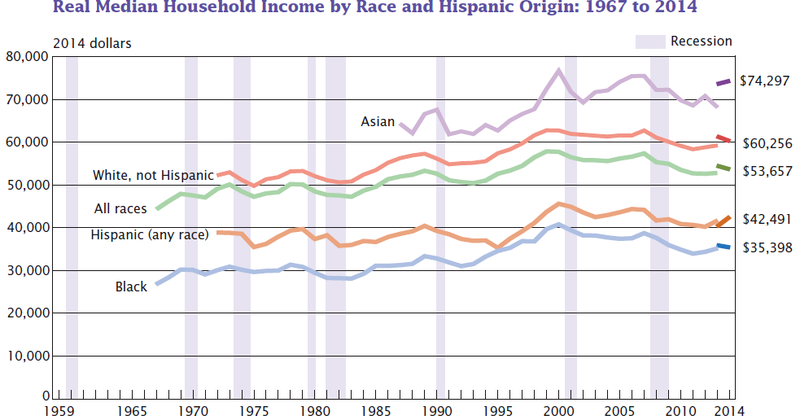 The lower-income class marriage rate has dropped from 84% in 1960 to 48% in 2010. Policy should therefore focus on removing the marriage penalty in all government programs. 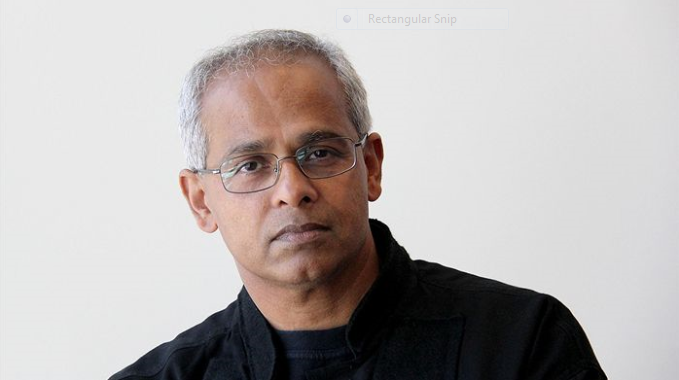 The basic forces of globalization and growing technology use are driving this societal change. The best way to respond is to enable more people to benefit from these basic trends. In my last post, “Can the U.S. Economy Do Better?” I laid out the view of the Hoover Institution economist John Cochrane that a few basic changes such as deep tax reform, a thorough overhaul of social programs, more educational competition and regulatory simplification would go a long way towards perking up the economy. The Global Financial Crisis (GFC) was not part of the normal boom and bust cycle, but rather the collapse of the postwar economic expansion under the weight of four main factors: high debt levels, large global imbalances, excessive financialization and an unsound build-up of future entitlements. The economy risks becoming trapped in a QE-forever cycle. 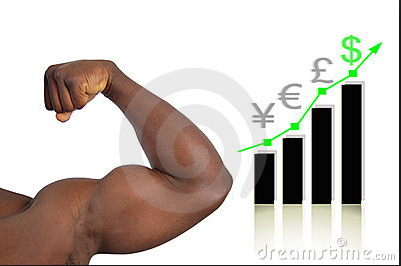 A weak economy leads to expansionary fiscal measures and Quantitative Easing (QE). If the economy responds then interest rates will go up and lead to a debt crisis. If the economy does not respond, then there is pressure for additional stimuli. The economist Robert Gordon predicts that the future U.S. growth rate, adjusted for six big headwinds (demographics, declining educational attainment, rising inequality, effects of globalization, environmental costs, and debt overhang) may only be .2%, well below the 2.1% growth rate of the past few years. The GFC may signal the zenith of globalization. The U.S. could function successfully as a closed economy, with foreign trade making up only 15% of GDP. The European Union and China could also turn inward. The rise of autarky and nationalism is a dangerous cocktail. Financialization drives inequality. QE and low interest rates encourages high-income households to increase investments and therefore boosts the stock market. The increasing cost of healthcare, higher education and childcare is a big burden on low-income households. Financial repression is increasingly accompanied by political repression which engenders lack of trust which in turn drives political disengagement and social disorder. Ouch, ouch, ouch! This is a very negative assessment of the U.S. economic and social scene today. But I report the views of Mr. Das because they are reality based and need to be dealt with. For seven years following the end of the Great Recession in June 2009 our economy has been plodding along at an average growth rate of 2.1% per year, much more slowly than after a typical recession. Instead of talking about how to fix the mess we are in, most of the presidential candidates are proposing measures which will make things even worse. Restrict Trade. Free exchange is the cornerstone of a growing economy. Raising tariffs will restrict imports, cause inflation and harm American consumers. Killing the Trans Pacific Partnership, stopping the Keystone Pipeline, and curtailing legal immigration would just be a start. Make Work Illegal. Raising the minimum wage to $15 per hour will do lasting harm to underprivileged teenagers who are denied a first job. In the U.S. today over 30% of jobs require a government license compared to only 5% in the 1950s. This creeping need for permission keeps untold millions out of the labor force. Tax People More Unequally. Why should the tax code be riddled with exemptions, deductions and credits which primarily benefit the wealthy? Why do we insist on taxing corporations at 35% when all other advanced economies are competing to lower their corporate taxes? 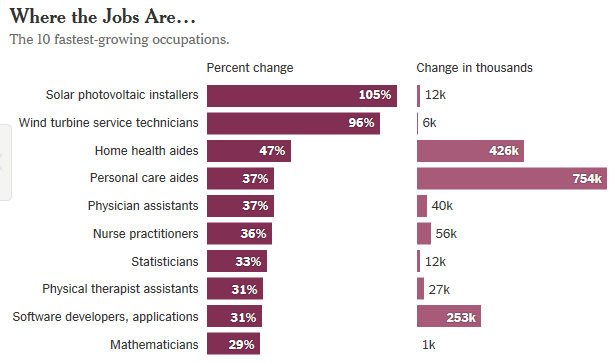 This simply drives jobs overseas. Stop Innovation. Why does Washington continue to favor big banks and bail out old established industries? A generation ago 1 in 6 companies were startups: today 1 in 12 are. Increase the Debt. Debt has more than doubled in the past decade, yet interest payments in 2015 were the same as in 2006, because rates are artificially low. How long can this last? A sure path to a slow growth future is this kind of fiscal profligacy. Just call it investment and hope that most people will ignore the problem.